Here's another free brush set for you guys! 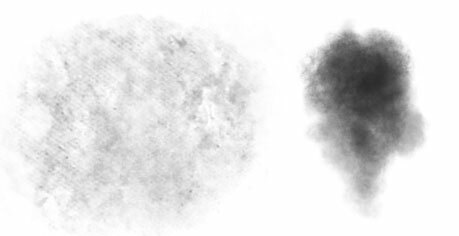 This is one of my favorite brushes for adding effects. The first brush is the original version - no settings applied here. As for the second one, I customized it for painting textures. This brush has a subtle crisscross pattern like some old fabric and it adds a really nice effect. I use this for adding an old and worn look or a grungy feel to a picture. You can also try using this for painting smoke or smog. I'm pretty sure there's a lot of other things you can do with this set so I hope you find it useful. This brush is also great as an eraser. Try erasing the edges of a photo with it to get a nice ragged edge. Lower the opacity to about 25% and erase certain areas of a picture for a subtle grunge effect.